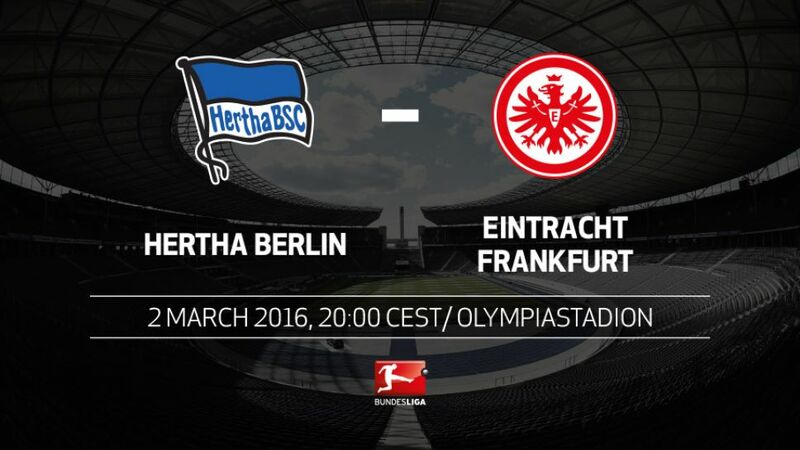 High-flying Hertha Berlin will be looking to consolidate their place in the top three when they host Eintracht Frankfurt this Wednesday (kick-off 20:00CET/19:00GMT). Hertha opened up a three-point cushion over the chasing pack with a 1-0 win in Cologne at the weekend and their unlikely challenge for a place in the UEFA Champions League next season is showing little sign of stuttering, with the crowds flocking back to the Olympiastadion to see Pal Dardai's men in action. Frankfurt would gladly trade places, with the prospect of a testing season finale for Armin Veh's men lying in wait. Without a win in their last five, the Eagles are hovering just above the bottom three ahead of their test in the capital. Hertha have 39 points – a tally they last had at this stage of a season back in 2008/09.Berlin already have four more points than they got in the whole of last season.Hertha registered their first away win of the second half of the season in Cologne last Friday.Frankfurt are on a four-game unbeaten run against Hertha, with three draws in their last three meetings.Berlin are unbeaten at home in six games, their longest such run since the 2008/09 season.Hertha's last three home games ended in draws and another draw would equal a club record for consecutive home draws.Alexander Meier has scored on the last four occasions he has met Hertha (for a total of five goals). Absentees: Anderson (light training) Flum (knee), Reinartz (groin), Castaignos (light training).